Equipment operator Ben Dolan uses a 66-hp Bobcat E85 excavator, which has a 13-in. tail overhang. 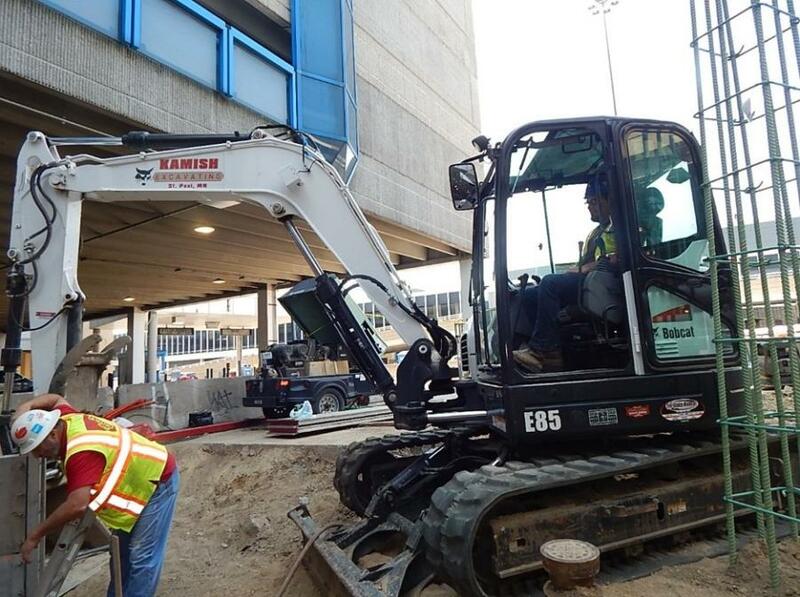 Keith Kamish, co-owner of Kamish Excavating, said the E85 can work in compact environments, including construction, landscaping, utilities, rental and agriculture. 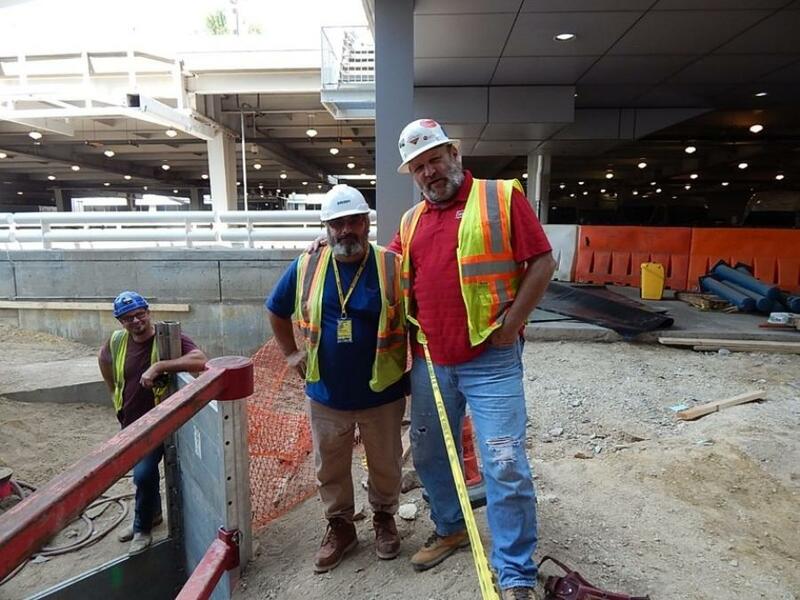 Installing a new baggage system in a confined space over decades' worth of infrastructure at one of the Midwest's busiest airports could have been a formidable task if not for the combined know-how of Sheehy Construction, Kamish Excavating, Gary Carlson Equipment and a team of industry specialists. 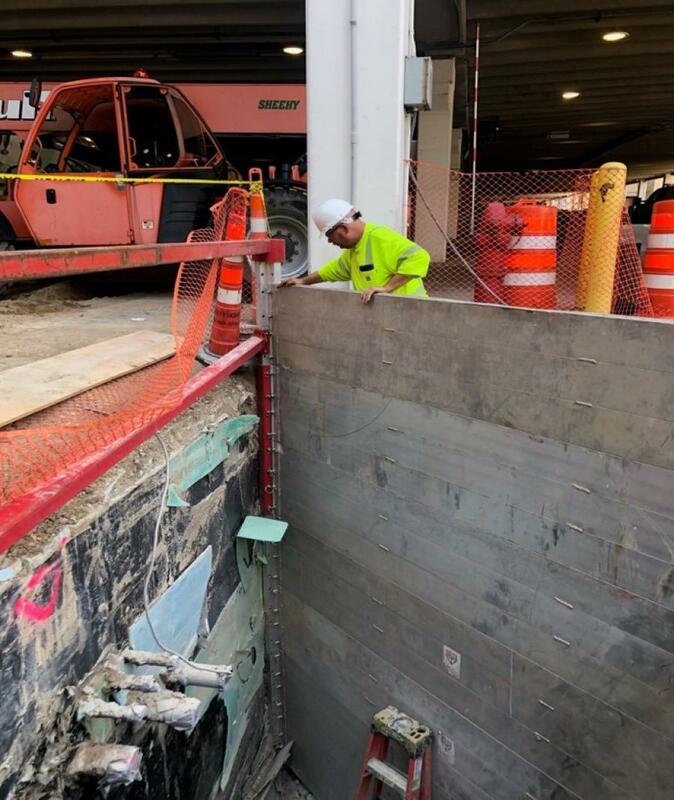 The project called for replacing a bag conveyor beneath the upper level roadway at Terminal 1 of Minneapolis-St. Paul International Airport. The new device, designed to enhance automated maintenance and jam-clearing, will support the Delta Air Lines check-in system scheduled to become operational in January 2019. The project required construction of a new footing adjacent to an existing basement wall. The bottom of the footing was set on top of limestone bedrock at a depth of about 14 ft. below existing grade. 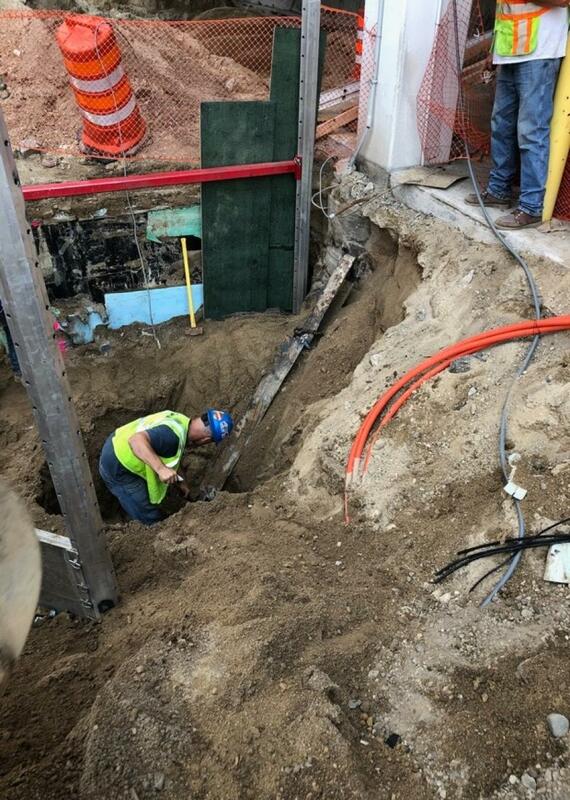 The proximity of a vast network of underground utilities and water lines prohibited the use of an open-cut excavation, however, and required installation of a temporary excavation support system. 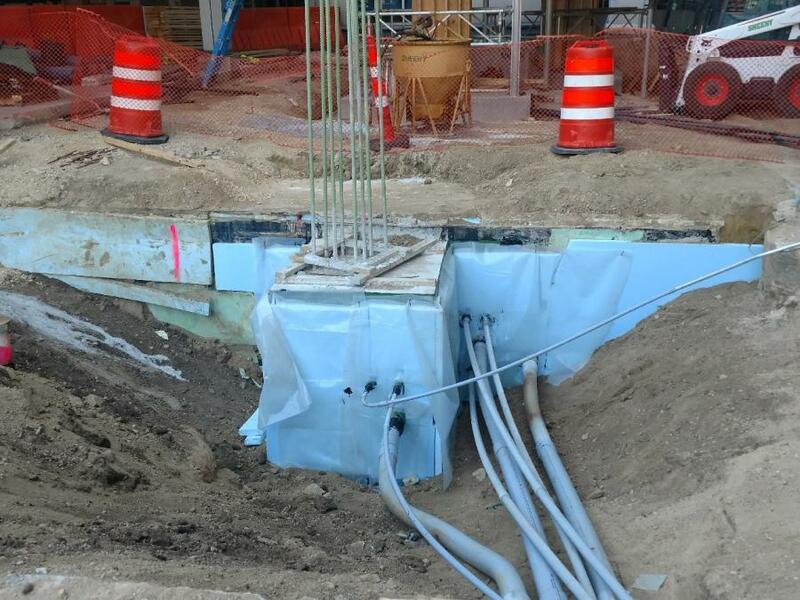 Sheehy Construction hired Engineering Partners International LLC to design the support system, which consists of a three-sided trench shoring box, with the fourth side left open and placed against the existing basement wall. Due to the presence of the utilities, the shoring box had to be constructed with four unequal sides, which in turn required the design of custom struts. 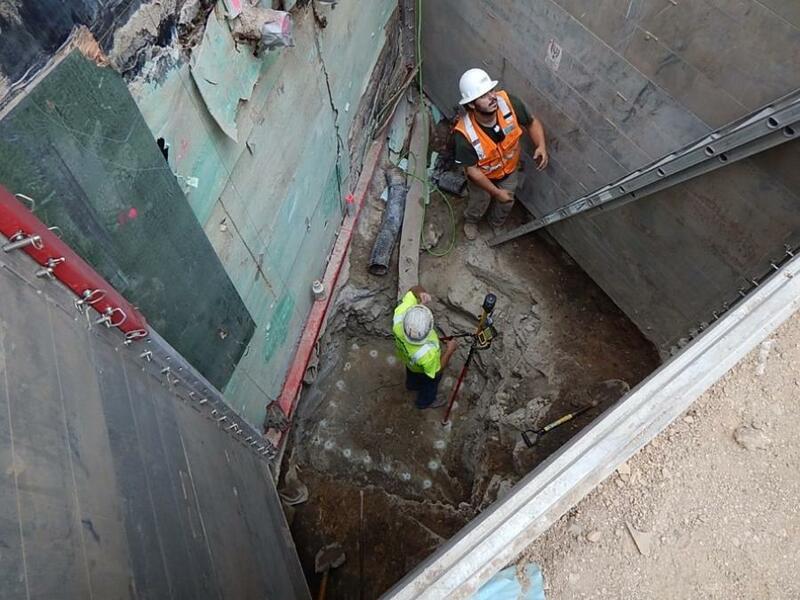 Once the shoring box was in place, the corner posts were anchored to the top of the bedrock, allowing removal of the intermediate struts and leaving the corner posts supported at the top and bottom. As a result, the new footing and pier could be formed and poured without interference from the intermediate struts. Sheehy Construction, St. Paul, brought on Kamish Excavating as the subcontractor for excavating the large custom piers. Founded in 2001 by Keith and Angela Kamish, the company, also based in St. Paul, specializes in earthwork, structural demolition, interior demolition, environmental site remediation, and emergency response services. To solve the delicate problem of working around the utilities and water lines, Keith Kamish contacted Joe Miller at Gary Carlson Equipment, who immediately thought the job would be a perfect application of the MOD Series trench shields from Pro-Tec Equipment, Lansing, Mich., a leading trench shoring and shielding products manufacturer. The MOD Series is a modular, aluminum, trench-shield system that was lightweight and compact enough to fit into the constricted project area and easily transported via pickup truck. It can be used as a two-, three- or four-sided system with existing components and can be changed on the fly at a job site to meet shifting requirements. Standard features of the MOD Series include a smooth-wall-panel design and foam filling that prevents soil and water buildup. Bottom panels can be removed to allow for cross utilities, and the two-way corner posts allow two-, three- or four-sided configurations. The system also accepts telescoping spreaders, and lifting eyes provide convenient pick points.